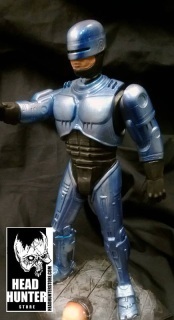 The Enforcement Droid Series 209, or ED-209, is a fictional robot in the RoboCop franchise. The ED-209 serves as a heavily-armed obstacle and foil for the series' titular character, as well as a source of comic relief due to its lack of intelligence and tendency towards clumsy malfunctions. The ED-209 was designed by Craig Davies, who also built the full size models, and animated by Phil Tippett, a veteran stop-motion animator. Davies and Tippett would go on to collaborate on many more projects. As one of the setpieces of the movie, the ED-209’s look and animated sequences were under the close supervision of director Paul Verhoeven, who sometimes acted out the robot's movements himself. In July 2012, a redesigned ED-209 was revealed in the OmniCorp viral website. 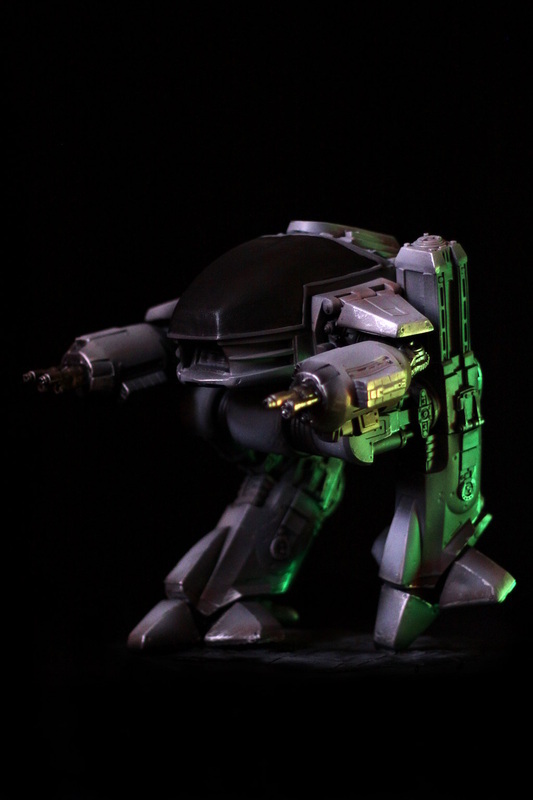 The new ED-209 is slimmer in design and more heavily-armed than the original version. Comes with BOTH head options. These are magnetised so you can also pose Robo looking in any direction.